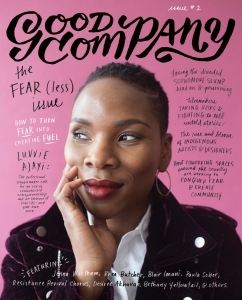 Published last season in the wake of her continuing bestseller In the Company of Women, Grace Bonney’s Good Company is the innovative and supportive journal for women and non binary creatives at every stage of life, founded on the power of inclusivity, diversity, and celebrating the differences that unite. Its mission is to provide motivation, inspiration, advice, and a vital sense of connection and community. Sharing everything from overarching philosophy and pep talks to useful, targeted advice, the debut Community Issue brought together diverse voices (including Tavi Gevinson, Cynthia Erivo, Julia Turshen, Emma Straub, Ashley C. Ford, and Beejoli Shah) and experiences (from woodworkers, tattoo artists, bakers, mental health advocates, designers, and more). The Fear(less) Issue continues Good Company’s mission to provide an energetic and highly stimulating place to connect, learn, grow, and work through the challenges that women across the spectrum experience in pursuing their passions and dreams. The Fear(less) Issue focuses on the subject at the heart of any kind of ambition: failure. We all fail - but it’s how we fail, and how we recover, that separates a positive experience from a negative one. This issue shares words, stories, life lessons, and more as it explores something we all shun, yet which has a power unlike any other to help us succeed. A biannual journal of inspiration, community, and practical advice for creative women.